Although the exact melasma causes are yet to be identified, many skin care experts are of the opinion that it can be triggered by a variety of factors. This disease typically refers to hyperpigmentation on face areas but can apply to dark skin patches on any area of the body. Here is a list of all major causes and risk factors for this disease. What causes melasma on face? Excessive exposure to ultra violet light. Family history, skin discoloration diseases such as Vitiligo, etc. Health research has shown that incidents of melasma are especially high in the summer unlike in winter. In summer, the main causes of melasma are sunlight exposure and UV rays. Over exposure to the sun may cause over production of melanin and your skin to develop dark patches. How to treat melasma caused by sun exposure? Invest in a sun block moisturizer. Experts believe that the best sun block to give you maximum protection is SPF +50. The major challenge of melasma treatment is treating the hyperpigmentation without causing discoloration to the surrounding skin. 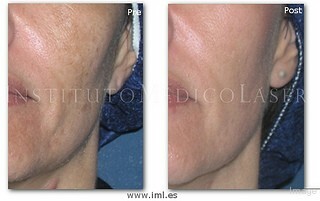 If using treatment by laser for melasma, it is important to use the right laser technology for your skin color. When melasma appears during pregnancy, it is commonly known as Chloasma. During this time, there is an increase in the production of hormones such as estrogen and progesterone. An increase in melanocyte stimulating hormones also occurs, especially in the last two trimesters of pregnancy. However, many experts argue that the major melasma causes during pregnancy are due to the increased level of progesterone and not the other two hormones. As for Chloasma treatment and prevention, there is substantial evidence that shows women who received hormonal replacement of progesterone after menopause had a higher chance of developing melasma, unlike those that received estrogen during the hormonal treatment. The best melasma treatments are topical lotions. The skin care product market is flooded with lotions that promise to make skin look suppler, fairer, and even younger. However, some of these products contain products that are harsh to the skin and, as a result, may increase the likelihood of developing this disease. Some of these products are not compatible with all skin types despite what the label on the product says. It is important to test a product on the inside of your elbow and see if it reacts with your skin within a period of 12 to 14 hours. The skin on this area of the body is the most sensitive and is the best to test and see whether a product reacts with your body. Many homeopathic remedies for acne and melasma exist. A number of herbs have been used to lighten and even out skin tone and color. Some people are genetically predisposed to developing melasma because it runs in the family. It is important to avoid developing the condition by avoiding over exposure to the sun and using sun block protection on your skin. This will prevent over production of melanin, which will cause dark spots. Women should also avoid using birth control pills or even going for hormone replacement therapy if it is not necessary. Hyperthyroidism & acne is also another cause of this skin disease. However, to know the real melasma causes you will need to go to a doctor for an accurate diagnosis and best natural melasma treatments. The doctor will be able to provide you with details about your condition and any other questions that you may have. The doctor will also be able to advise you on how to go about your treatment for hyperpigmentation disease. Some recommendations include the use of topical melasma creams or laser treatment depending on your budget. What the natural remedies I can use to treat Chloasma? I am 31 years old pregnant women, and my father has vitiligo disease (he die 2 years ago).